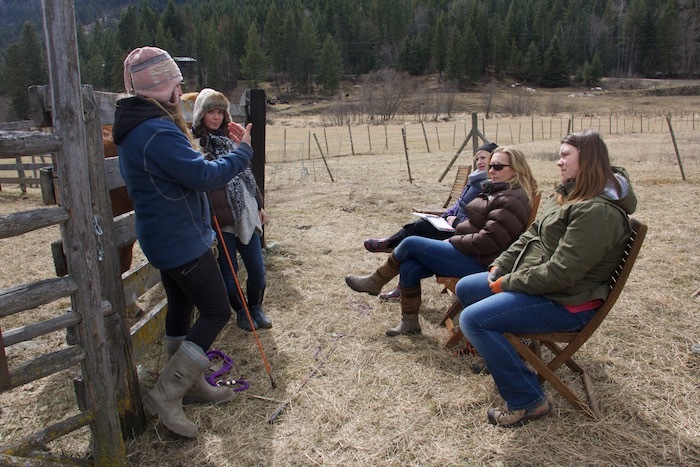 Women Who Run with Horses: Equine Guided Mentorship program is for equine guided facilitators that are looking to grow and expand their business, leadership and purpose with horses. We are drawn to horses because we believe in the partnership that is found there. We are passionate about what horses encourage and develop with our clients and our joy of facilitating with them. Developing our unique presence in our leadership and the development of a successful practice with horses is a completely different beast. The partnership with horses is powerful and deeply necessary in our world our success in our practice is important to support it. I stepped into equine guided facilitation in 2006 and spent 3 years training with various experts in the field before I embarked on my own practice. Horses always felt deeply important to my purpose. I was drawn to them and what they represented and was passionate about bringing their wisdom into the world. After stepping into training, I had to navigate the world of how to actually build a business and practice around horses. I struggled for many years because I was not able to empower or step into the business woman aspect of my work but realized from running a retreat center and having a high overhead, I needed to. I have spent the last 6 years building my practice with horses. I blended in my coaching work and I now run an 80 acre retreat center that is home to 24 rescue horses, where I have men and women journey from all over north america to come to our retreat. Horses are a focal point of my business and have helped me grow into a 6-figure practice that supports my visions of having a space where I can share the medicine and teachings of the horse. this Mentorship Program Is Unique. I believe deeply in our ability to navigate both the practical pieces of building a business while aligning ourselves to the energetic and intuitive spaces of our purpose and the medicine of horses alongside of it. This 4-month mentorship brings together business building, leadership development, and a deepening of our partnership with horses into one program. Partnering with facilities or preparing our own for workshops and retreats. The first two months we are looking at everything that goes into building and developing a practice. Month 3 is an opportunity for us to get refined in our unique leadership and vision in our work, developing our voice and owning the uniqueness of what we bring into the partnership with horses. When we own our leadership, when we feel confident in how we hold space with the horses, we are deeply compelling and attractive to our prospective clients. Knowing the depth of teaching and wisdom of our horse partners is important, deepening our awareness of their medicine and their purpose with us expands the depth of the work we can bring to the lives of those that are called to journey with us. Month 4 is an immersion into all things horse medicine, horse behaviour and deepening our purpose and understanding of it with our herd. Where horses can guide our activities as we journey with our herd. 3 1:1 calls each month to deliver each module and facilitate the training and provide coaching to each participant. All material will be recorded for you to come back to at any point in the future.